Are you producing the volume and quality of work that you want to? Do you feel confident about your work every day? And are you certain that your content resonates deeply with the audience you want to attract? Most of us have days when we don’t feel 100 percent good about one (or all) of those questions. Make your content more magnetic to the audience you want to attract? If this sounds kind of ShamWow, I sympathize. But there’s a simple, easy mindset intervention that’s well supported by psychological studies. And it’s well worth a few minutes of your time to find out if it will work for you. To avoid the confusing term affirmation, I call this exercise a values statement. It’s easy to do, and it can have a big payoff. Find (or just think up) a list of abstract values. Things like Patriotism, Faith, Family, Justice, Peace, Equality, Freedom, Creativity, Beauty, Connection, Friendship, Delight, Silliness, Serenity, or Joy. Without wildly overthinking it, pick three or four that are important to you. I encourage you to leave aside values that you think you should care about. Don’t choose World Peace if that’s not a value that really drives you every day. Now: Pick one, and write about it for 10 minutes. You can write about why you care about it. You can write about how it plays out in your life. You can write about goals you have that would bring more of the value to you. Just hold that abstract idea in your head for 10 minutes and write down how it’s kicking around in your brain at the moment. Now … here’s how it can help. One thing I love about values statements is the way they can get me moving when I’m feeling stuck, cranky, or unmotivated. Lots of successful people will tell you how important it is to find your Why when you’re working on a big project. Then they suggest a pile of time-consuming, energy-intensive tasks to figure that out. All of that is probably a great idea. But let’s face it … if you’re feeling unmotivated right now, you’re not going to do all of that complicated stuff. 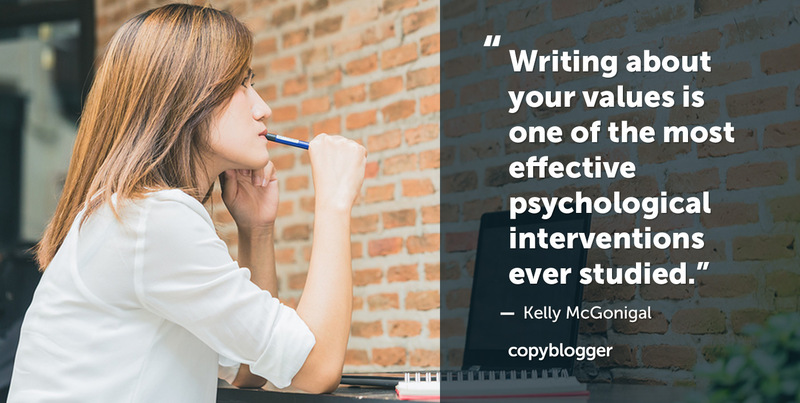 Ten minutes spent writing about any value that matters to you will help you feel energized. It will remind you of what gives your life meaning. And it will help you focus more on that, and less on the daily fiddly stresses that can leave you drained. Neurological scans suggest it’s possible that values statements help us be more receptive to things like good advice and improving habits, because reflecting on values improves our sense of self-worth. A few weeks ago, I was having a cranky day. My to-do list was long and full of things I didn’t really feel like doing. I remembered this exercise, and spent 10 minutes in my bullet journal writing about Teaching. Teaching and Learning is a core value for me, and one that drives many of the choices I make in my life and my business. When I was done with the exercise, I felt physically lighter. I had a clarity and a sense of purpose that made my to-do list seem much more manageable. And I got back to the work that matters most to me. Ever have that horrible feeling that you’re the last person on the planet with anything valuable to say about your topic? It’s called impostor syndrome, and many wonderful writers and content marketers wrestle with it. Often, the more you know, the harder it is to feel confident about your topic. Your curse of knowledge makes it abundantly clear just how much you don’t know. Sitting down and writing about values helps you remember that your goals are bigger than you are. Crocker’s research, as well as other studies, looks at how “bigger-than-self” goals can help offset toxic stress, including that caused by impostor syndrome. And values statements are a fast way to uncover your own “bigger-than-self” goals — the altruistic intentions that weave through the goals you already have. Values statements can even help people grappling with very serious self-image issues. One study showed that minority students who felt under threat because of stereotypes became more likely to pursue college when they performed this exercise. Minority students who wrote a few brief statements about values in middle school became more likely to enroll in college and more likely to pursue challenging courses. A few fast writing exercises changed their behavior — and therefore their outcomes — years into the future. Other studies have shown similar results for college freshmen. In fact, there are thousands of articles posted every day about how you can find more customers and make more money with your business. Although the volume is overwhelming, the truth is, a lot of that advice won’t be right for you. When you’ve spent time thinking about your values, you’re better able to sift through advice and come up with answers that make sense for you and for your business. Your values become a compass that will steer you in the right direction when you’re feeling lost. They can also help you see when it’s okay to use a technique that might feel a little awkward at first. For example, if one of your key values is Respect, you’ll avoid belittling your audience in the name of “agitating” their problem — even if you’ve seen that “work” for another company. But you might well uncover a point of “agitation” that empathizes with and respects your audience’s struggle, instead of condescending to it. And you might also realize that there’s nothing in a strong, clear call to action that conflicts with Respect. So even if it sounds a little bit like an infomercial (good calls to action often do, because infomercials need to pay for that expensive air time), you can feel confident that you’re staying in your values lane. And when you stay checked in with the values that matter most to you, you’ll also resonate on a deeper level with the specific audience you want to attract. Values attract values. Spending regular time writing about your values will help remind you that you’re a worthwhile human being whose life has meaning. And that will help you take wiser, better action, in any arena of your life. Have you ever tried making a values statement? How did it feel? Do you think it was helpful? Great article and great take on value statements. I enjoyed the read. Thank you! Thanks for this article, I needed it today! Great practical advice that I’m going to try out. I’m redoing an ecourse I wrote a couple of years ago as an online course to put on udemy. In my intro module I talk about your values and beliefs and that they show up in everything you write (website, blog posts, social media posts…) or do. I just read your values exercise and it’s wonderful. May I use it as an exercise in my course and give you credit, please?? Doing is just about the best confidence-builder there is. Good luck with it!